Realising that many of us in the office were yet to cast our votes for the year, and with time running out, inspiration struck to create a web app that would save us, and other lazy voters, time and effort. Thus the ‘No Worries 100’ was born. We knew triple j had already enabled Spotify integration on their site, allowing voters to connect their account and import playlists as voting shortlists. Using our years' of experience with the Spotify API and playlist generation technology, we set out to create a web app that would generate a playlist of the top played tracks from a user’s Spotify listening history that were on the voting list for the Hottest 100. First, our designers and copywriters came together to capture the essence of triple j’s Hottest 100. 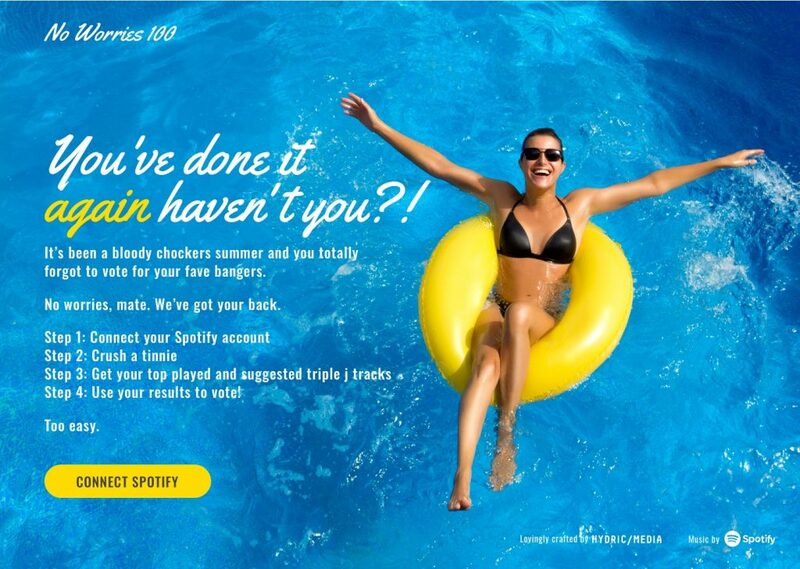 Bright and summery colours were used in the app design to invoke the stunning Australian summer. The copy was intentionally peppered with Australian slang, ultimately influencing the name of the site itself. In the meantime, our developers started working with the list of tracks up for nomination in the Hottest 100, creating a Node.js app to map the list against Spotify track IDs. Ingesting the triple j voting list using a text based lookup had a pretty good hit rate, but we did need to manually remove some false-positive matches. Now that we had an accurate pool of Hottest 100 tracks returning in our results, we had to figure out how to best suggest these tracks to listeners. Initially we tried loading the user’s top-played songs to cross reference against the pool of 2017 triple j tracks. However, this approach resulted in the generated playlists being far smaller than desired, even for the avid triple j fans within our testing pool. In order to boost the size of these playlists, we broadened the track-matching parameters to include songs whose artists appeared in the user’s Spotify listening history. This gave users more options for voting whilst still returning relevant results. The last step was for users to save the playlist to their Spotify account and then import it directly into the triple j voting system. The result was an experience that shrunk the voting process, which may ordinarily take hours, down to a few minutes. We’re thrilled with how the No Worries 100 turned out. 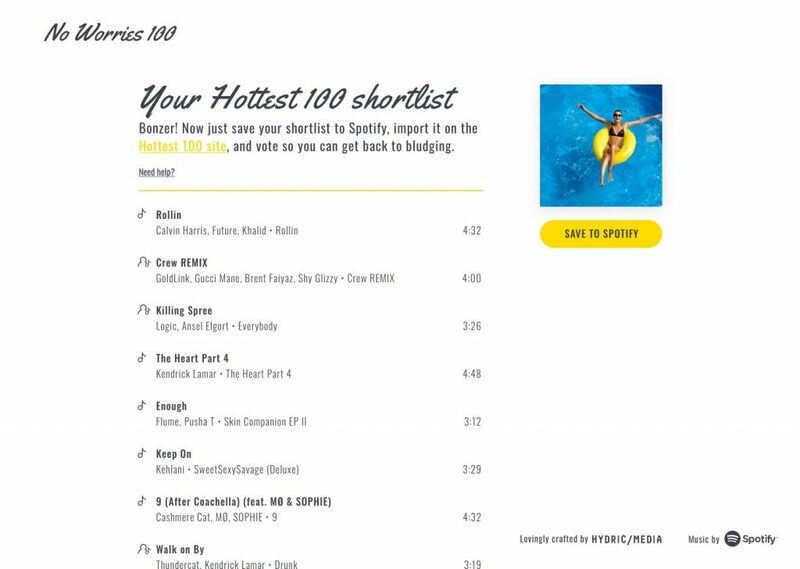 Not only was it a testament to the incredible work the Hydric team can pull together in a short space of time, but it was also a personal triumph for the lazy Hottest 100 voters in the office. We can’t wait to revisit it next year for an even bigger, better, and lazier Hottest 100. Interested in taking a look? You can find it here.